ZOTAC International, a global innovator and channel manufacturer of graphics cards, mainboards and mini-PCs, today ushers in a new era of quiet computing with the ZOTAC GeForce® GT 640 ZONE Edition and GeForce® GT 630 ZONE Edition graphics cards. The ZOTAC GeForce® GT 640 ZONE Edition redefines quiet computing with a new video processing engine and supercharged architecture to create the perfect card for home theater PC and everyday use while the ZOTAC GeForce® GT 630 ZONE Edition delivers an outstanding value to quiet computing users. Packing a new enhanced video processing engine, the ZOTAC GeForce® GT 640 ZONE Edition takes the home theater PC to the new 4K era with 4K video decoding capabilities for stunning details and smooth playback of high-resolution video up to 4096x2160 resolution. A new NVEnc video encoding engine integrated in the ZOTAC GeForce® GT 640 accelerates video encoding tasks for lightning-fast video conversions and transcoding, with compatible software. Triple-display support with NVIDIA® Surround technology makes the ZOTAC GeForce® GT 640 ZONE Edition a productivity booster by maximizing computing efficiency and enabling simultaneous displays of multiple application windows. NVIDIA® CUDA® technology accelerates compatible video and image editing applications on the ZOTAC GeForce® GT 640 ZONE Edition to quickly and smoothly apply effects without making a single fan-whisper. The ZOTAC GeForce® GT 630 ZONE Edition is available for less demanding users that desire silence, adequate performance and outstanding features at an excellent value. 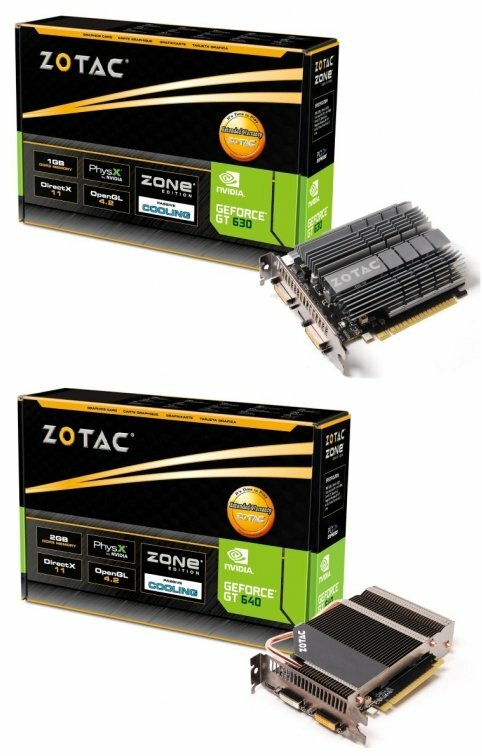 It’s time to play with the ZOTAC GeForce® GT 640 ZONE Edition and GeForce® GT 630 ZONE Edition!